A recent tradition, the Yard Sale Days teamed up with the Garden Walk and new this year, also the Home Tour to maximize on the foot traffic in the neighborhood that weekend! 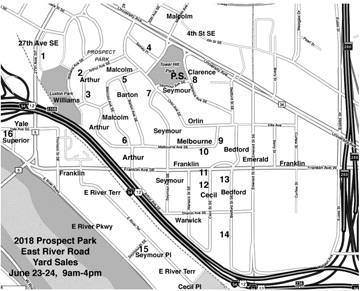 Locations of Yard Sales that participate are featured on a map available at local shops and at all sale sites. This event helps people find new-to-them treasures and clean out useable household items from the neighborhood. If you are interested in participating in Yard Sale Days, please contact Gib Ahlstrand for more information. Also, advance notices for registration will be on the ppe-list. Neighbors can register if planning a garage or yard sale on this weekend. The coordinated effort is advertised within and outside the Prospect Park and East River Road neighborhoods. Registration Fee: $10 (required, covers advertising/printing costs and gets your sale on the map flyer). Cash or check payable to Prospect Park Association. To register, deliver or send fee to Gib Ahlstrand, 50 SE Barton Ave. (secure mailbox) or call, 612-379-1338. Deadline: Tuesday, June 18, 6pm. You will receive a receipt. Registrant's Locations: will be shown on a map flyer (no other personal information will be released), and a line of text describing items you have for sale will be included. You will get 25 flyers to hand out at your sale. Our permanent Yard Sale/Garden Walk signs will be posted along major streets in the PP neighborhood the week before the sale. If you only want to sell on one of the two days, specify which one in your registration. Ads: Will run in the Star Tribune, Pioneer Press, The Highland Villager, and The St. Anthony Park Bugle, and the map flyer will be available at local businesses. Include your e-mail address, street address, and short list of typical items for sale, which you can update later as time for sale draws near. Gather boxes and bags for shoppers. All it takes is a few minutes a day. Just toss your yard sale items into a corner in your basement or garage (but you should be doing this all year long!). Wipe off any dirt, grime or dust to make items look more appealing. Price items individually, or per box, etc. I usually have a box of stuff where I will give a 10 cent credit if shoppers will take an item! Priced items usually create a better opportunity for negotiation and a sale, than unpriced items. Yes, our Yard Sale-Garden Walk signs will be posted around the neighborhood during the week before the sale, but it's also advantageous to make your own signs to post on your street and at your location. This is your chance to express your inner flamboyance! For visual examples, see the banner image on this page! Best of all, try to have fun with this! Play music on a CD player during the sale, prepare some sandwiches and snacks in advance to sustain you through the day. This is a great social opportunity too, so chat up your customers — the stories you will hear! The one of the scam team "Pirate and the Artist" is one I will never forget. Gib Ahlstrand organizes the annual Yard Sale and produces a map.